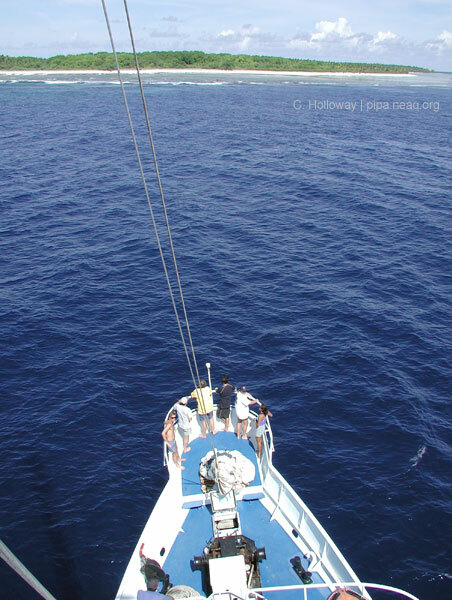 400 miles north of Fiji, 30 knot winds, 12 foot seas, meals served in bowls, waves and spray continuously wash over the starboard side of the vessel, a challenge to take a shower, walk or even sleep as you have to compensate for your body being thrown this way and that by the erratic motion of the sea and vessel. A few people are seasick and lying mostly in their bunks; others sit where they can, lying where they can, and eat when and what they can. We are passing through the inter-tropical convergence zone. I wrote the above passage a couple days ago. Now we are within 24 hours of our first Phoenix Island study site, Nikumaroro. The wind has died out considerably as we are nearing the equator, an area that is typically calmer. Northern and Southern Hemisphere weather patterns are separated by the equatorial region of Earth. Storms in the north spin counterclockwise, and storms in the south spin clockwise, but the storms never cross the equator, a natural boundary between these two halves of the earth. This long transit across this vast ocean, illustrates how isolated the Phoenix Islands are. And we want to make the most of the precious time we will have in the islands, to check the status of this large marine ecosystem that the government of Kiribati has protected. Now that the ocean has settled down, we are getting our science gear out and assembled--sampling jars, cameras, blue water diving rigs. There is a container of liquid nitrogen strapped to a post outside my cabin that will freeze biological samples. Every free place on the boat has either safety or dive gear. Today is also a day of safety briefings. It is one thing to pack, plan assemble a diverse group of scientists and travel to the far reaches of Earth to conduct research. 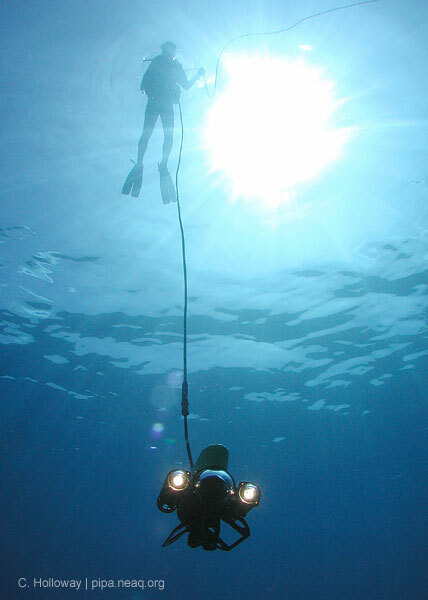 Once we get there, we have to conduct our work underwater, which adds another level of complexity to the tasks at hand. Our number one priority is safety and we have brought a variety of devices and procedures to ensure that we dive and work at this remote location as safely as possible. Dr. Craig Cook is the expedition medical officer. Craig has the usual array of emergency medical supplies and medicines, but he has also brought a hyperbaric chamber and emergency locating devices. Craig is an expert in diving emergency medicine and we assembled the chamber today for testing.